The people who support us. We are the only music camp in the marching arts addressing relevant women’s issues and looking to fill a specific hole that we perceive in music education: the lack of supportive environments for women in percussion and the lack of female representation in percussion sections. Many girls are used to being one of the only or one of the few girls in a percussion section, and others still are being pushed to play instruments other than percussion. We want to provide a place for all of these girls to come together and play. Additionally, the typical middle or high school girl does not have a female band director or percussion instructor. Our world-class staff is comprised of successful and influential women in the industry because if young women do not see or have access to successful female role models, they may not be aware of the musical opportunities available to them. Between the Women’s March, #Metoo campaign, and more women running for public office than ever, we believe the last year signals a national trend, so we are inspired to be the catalyst for female empowerment in the marching arts. Support from the industry and people like you shows that our cause speaks to more than just those of us involved in Girls March and that there truly is a need for this in our community at large. Help us show the marching arts that we are effecting change. Your support goes directly to scholarships, supplies for camp participants, and making the experience as powerful as possible for as many girls as possible.With your help, we can impact even more young girls who may not be able to afford to attend our camp by offering full or partial scholarships. 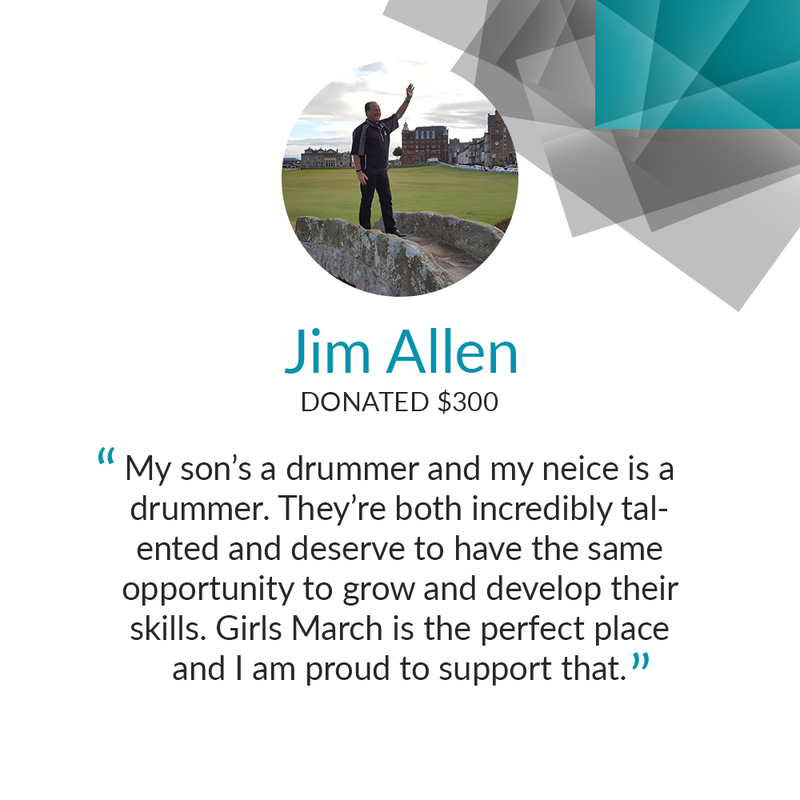 You can make a difference and help us reach our goal of providing every girl with access to a drum pad, sticks, and mallets, even if she doesn’t own any, and provide the supplies we need for our team-building and leadership training activities. A little goes a long way in helping us make this camp everything we want it to be. Your donation at any level is greatly appreciated. Please contact us at info@girlsmarch.org for more information! $5 will help us provide supplies for our leadership and team-building activities. $25 will help us provide drum pads to participants need to borrow one. $75 will help one girl rent an instrument. 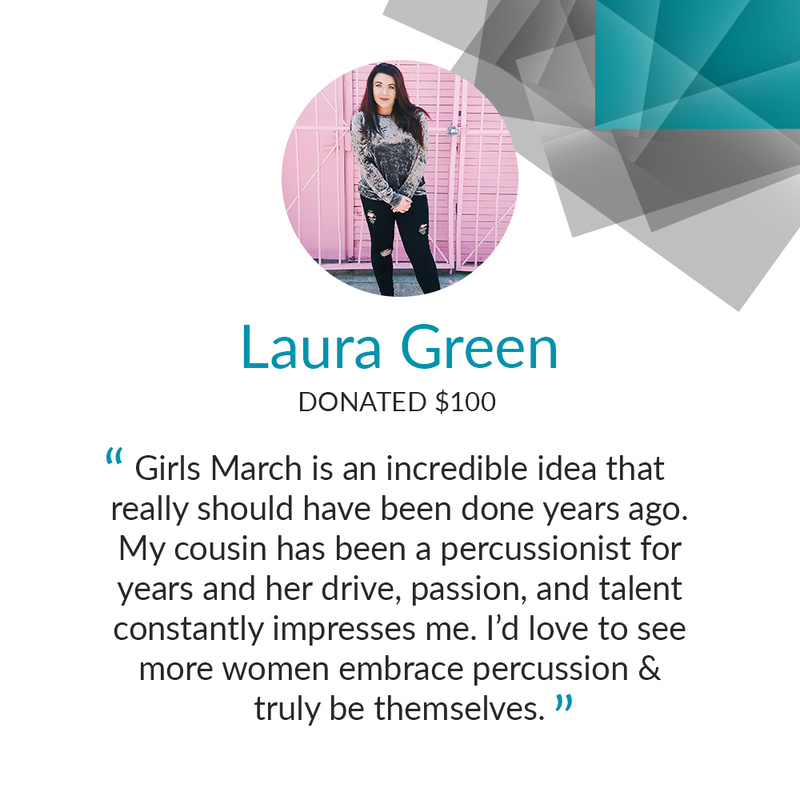 $200 will help one girl pay for half of her tuition to attend Girls March. 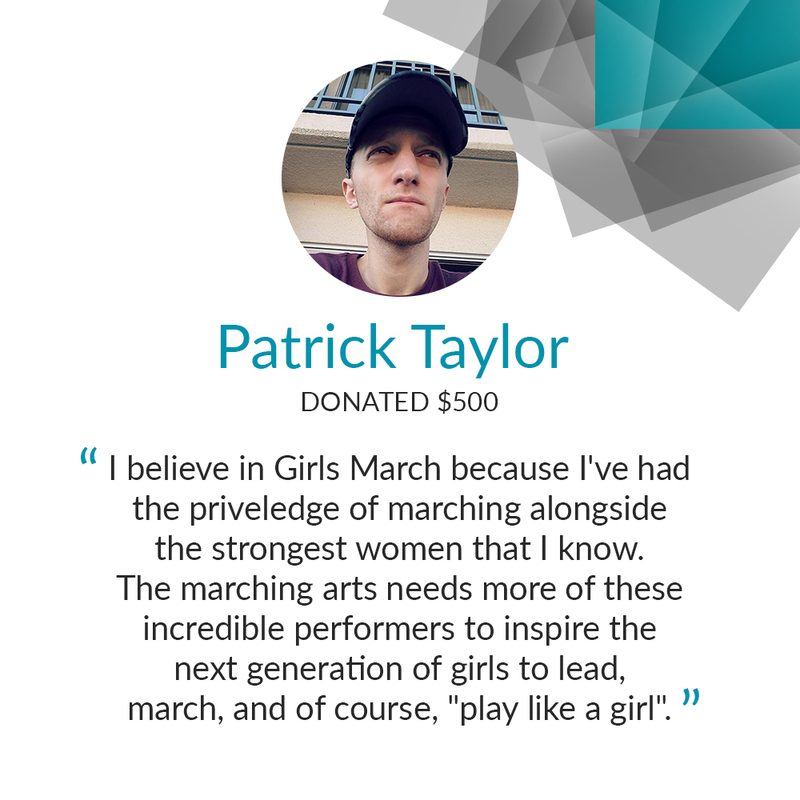 $400 will sponsor one girl to attend Girls March. Any donation, small or large, will make a difference and is deeply appreciated. Copyright 2018. Created with Aesthetic Media. Photography provided by Zach Ashcraft.